The efforts of the Hong Kong based Jal and Pervin Shroff’s family to provide a long-term, economically viable solution for The B. D. Petit Parsee General Hospital (PGH) moved a step closer to reality. On February 28, Jal, Pervin, PGH president Homa Petit and his wife, vice president Aban and others wielded a pickaxe in a symbolic groundbreaking ceremony for the proposed Shroff Medical Centre (SMC) of the PGH. Thanks to a munificent contribution of US $ 22.5 million (Rs 151crores) from the Shroffs, the single largest monetary donation ever made to the community, a seven-storey, 200-bed, state of the art, multidisciplinary, cosmopolitan hospital is to be built on the PGH grounds. 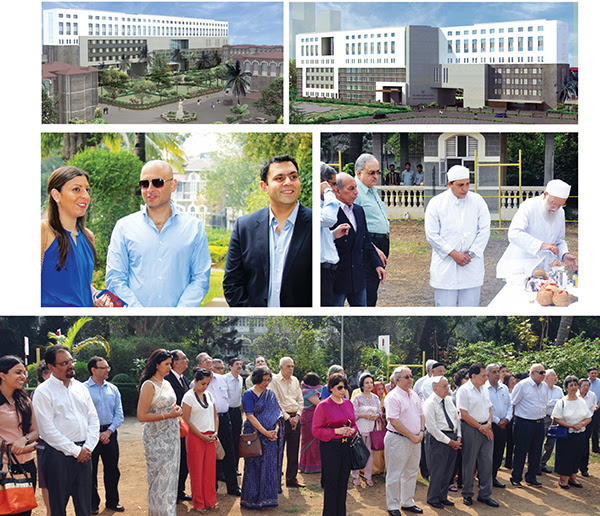 The surplus generated from the new Centre would be utilized to cover the current deficit of the PGH where the majority of Parsi patients are given either free or subsidized treatment. 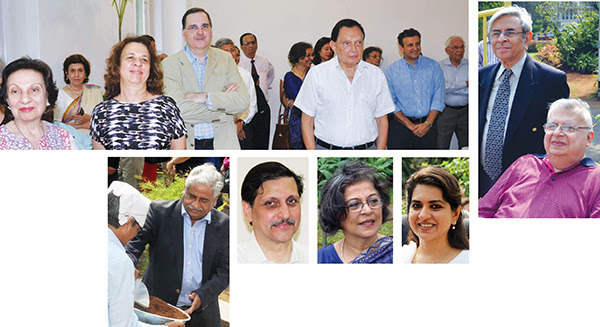 Prior to the groundbreaking, prayers were recited by Ervad Asphandiar Dadachanji before a gathering of the PGH committee members, a few doctors, the Bombay Parsi Punchayet (BPP) trustees, the Parsi Press and others. Jal said the event “celebrates a visible beginning of a new milestone in the history of this noble institution.” Noting that 53% of the existing PGH beds are used for “absolutely free or highly subsidized patients,” he pointed out the “occupancy of paying patients is declining. The financial losses are not economically sustainable. Remedial action had to be resorted to without delay. A viable solution had to be found to ensure the Hospital’s future.” The PGH will continue to serve only Parsi patients, stressed Jal. An agreement was signed on March 15, 2015 between the PGH and the Shroff family with the blessings of the BPP who are the owners of the property. The PGH has made available the unused FSI (floor space index). Well known conservation architect Brinda Somaya of Somaya and Kalappa has been appointed to design the new building and she says she has kept the ethos of the existing structures in mind. Former president of the Zoroastrian Charity Funds of Hong Kong, Canton and Macao for 27 years, Jal was running the family business S. Framjee and Company with Pervin when a business opportunity led them to co-found Fossil in 1984. Starting with watches, today Fossil is an international design, marketing and distribution company with an extensive line of men’s and women’s watches, jewelry, handbags and leather goods, sunglasses and other fashion apparel (see “Fossil for the fashionista,” Parsiana, September 21, 2011). The company went public in 1993 and is quoted on NASDAQ (National Association of Securities Dealers Automated Quotations). The World Zarathushti Chamber of Commerce had conferred on Jal its honorary membership in January 2012. According to Homa, the PGH financial fortunes started to decline on account of the community’s dwindling numbers, overseas migration, shift to the suburbs and smaller cities like Poona, difficulty in commuting, smaller nursing homes mushrooming in the suburbs and an inability to provide medical facilities such as CAT (computerized axial tomography), magnetic resonance imaging (MRI), catheterization laboratory (Cathlab) — (“to visualize the arteries of the heart and the chambers of the heart and treat any stenosis or abnormality found” — Wikipedia). There was a suggestion to set up a cosmopolitan diagnostic center on the PGH grounds to generate income but the management came to the “conclusion that a mere diagnostic facility would not, according to the doctors, be sufficient but if the diagnostic center was part of a secular hospital, which would be run on commercial lines, then, there would be a good possibility of subsidizing the deficit,” said Homa. Once the SMC is ready the facility will have to compete with other private hospitals in Bombay to draw patients. But the Parsi brand equity should help to give them an edge, all other things being equal. Kudos to Jal and Pervin Shroff for such a kind and meaningful philanthropic action. Such a selfless charitable act is a lesson to those whose donations get utilized for questionable purposes, and the donors invariably looking to gain fame and recognition. This is definitely one of those situations where we feel genuinely proud to be a Parsi Zoroastrian. Thank you, Jal and Pervin – your charity to help ailing people is certainly an exemplary example of putting the essence of ‘Yatha Ahu Vairyo’ in real live action. May Ahura Mazda bless you both. It is a great moment for the Parsi Comunity that we have in our midst such noble and charitable persons as Jal and Pervin. We are honoured by their action in advancing the name of the Parsi Comunity, which though so minor in numbers has in them such wonderful persons. God bless Jal and Pervin for their contribution to this noble cause. The whole Community salutes them.